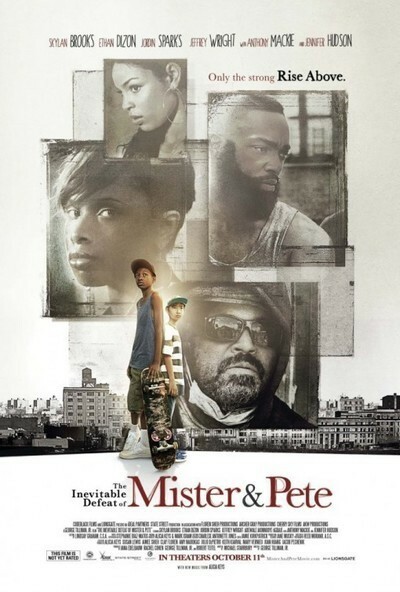 With its tale of two young kids left to fend for themselves in a Brooklyn housing project over the course of a sweltering summer, "The Inevitable Defeat of Mister & Pete" sounds like some ghastly combination of "Precious" and "Home Alone." The end result proves to be as awkward as its title thanks to its uneven screenplay and tone, and questionable casting in supporting parts. A few days later, Mister's life turns upside down when his mother is arrested during a raid on their building. He and Pete manage to avoid capture and decide to hole up in the apartment and wait things out for a few days while waiting his mother to return. But as the days stretch into weeks, it becomes apparent to him that she is not coming home. Not wanting to get caught up in the horrors of Child Services, the two continue to survive on their own by any means necessary while trying to overcome the lack of food, money and utilities and avoiding both the police and a loathsome local bully determined to make their lives miserable just on general principles. At first, it is fun—or as fun as possible under the circumstances—but as time goes on and their meager resources have dwindled to nothing, the fiercely proud and stubborn Mister finds himself in a position where he is forced to swallow his pride and ask for help at last. This could be powerful stuff in the right hands, but the screenplay by first-time writer Michael Starrbury is a bit of a mess throughout. Instead of providing a strong narrative line, he introduces a bunch of ideas and then fails to develop them in any meaningful way. As a result, the film feels more like a series of episodes rather than a fully fleshed-out story, and the unrelenting miseries grow tiresome, especially during the aimless middle section. Starrbury's handling of the Pete character is also a bit odd. Other than standing around and looking adorably inscrutable, his main function appears to be personally suffering all the potential abuses that a kid in his position might encounter—including physical and verbal cruelties and the predations of the neighborhood child molester—so that the audience can be horrified while still allowing Mister to emerge largely unscathed. This may not have been intentional but it does add an uncomfortable edge to the proceedings that just feels a bit wrong. Director George Tillman Jr. ("Soul Food," "Men of Honor") does what he can with the material but is unable to overcome the lack of dramatic tension or cohesion at its core. He further undermines the proceedings with the odd decision to populate the supporting cast with a number of familiar faces that stand out uneasily amongst the otherwise realistic surroundings—besides Hudson, there are appearances by Jeffrey Wright as a homeless man, Jordin Sparks as a sweet-natured former neighbor of Mister's who is now living in the lap of relative luxury thanks to her married lover, Adewale Akinnuoye-Agbaje as a cop in hot pursuit of the two kids and Anthony Mackie, wearing a beard of such insane majesty that arguably deserves its own screen credit, as the friendly neighborhood pimp. None of them deliver bad performances, but whenever one of them appears, any gritty realism that Tillman has managed to cobble together falls apart. Their presence will no doubt help sell the film, but they do nothing for the movie itself. "The Inevitable Defeat of Mister & Pete" does provide pleasures here and there. The two young leads are strong and sure, and relatively free of the affectations that can sometimes plague young actors. The score by Mark Isham and Alicia Keys (who also co-produced the film) is a treat throughout. For the most part, however, the film is just never quite as powerful or moving as it clearly wants to be, and though it tries to avoid mawkishness throughout, it winds up succumbing to it.